If your order weighs less than 13 ounces, save huge on shipping with USPS first class (with tracking number). This product weighs 6.9 oz. This is formula is also available in a version with iron. 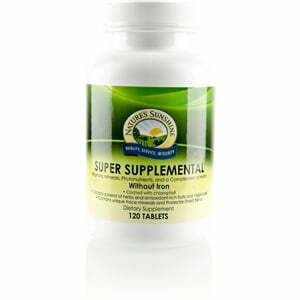 Nature’s Sunshine Super Supplemental Vitamins and Minerals without Iron provides 100 percent daily value of key vitamins and minerals to augment a diet heavy in processed foods or to nourish a body under stress or trying to heal. 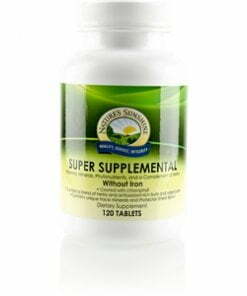 Super Supplemental Vitamins and Minerals without Iron supports many bodily systems, including the cardiovascular system, the respiratory system, and the digestive system. Instructions: Take two to four tablets daily with a meal. Cellulose (plant fiber), stearic acid, magnesium stearate (vegetable), lutein, silicon dioxide (powdered silica), Alfalfa herb (Medicago sativa), Asparagus stem (Asparagus officinalis), Barley Grass juice (Hordeum vulgare), Broccoli powder (Brassica oleracea), Cabbage powder (Brassica oleracea), Hesperidin, Lemon Bioflavonoids, Rutin, Rose Hips concentrate (Rosa canina), and Kelp plant (Ascophyllum nodosum and Laminaria digitata).